I bought these Henry Cotton's trousers when I was in Prague earlier in the year. They're a very, very lightweight ribbed cotton cloth of aquamarine. I thought they'd be good for pulling on for a beach holiday. I'll see later this month when the factory gates at Tweed Towers shut for bloggers fortnight and the Tweeds head to sunny climes. Henry Cotton's is part of the Italian Moncler Group, famous for the quilted jackets worn by Milan's paninari. 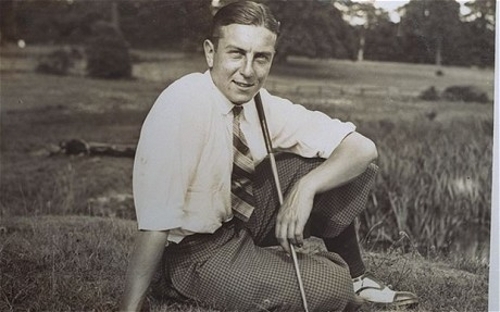 The company takes its name from golfer Sir Henry Thomas Cotton, born in Holmes Chapel in Cheshire in 1907, and winner of three open golf championships. An Italian company uses the name of a British golfer to produce clothes designed with a British influence. Would a British company use the name of an Italian footballer, by comparison? Gianfranco Zola has a certain ring to it. The trousers I bought are part of Henry Cotton's Spring/Summer Persuader: Elegance and Evergreen collection, inspired by The Persuaders, a 1970s British TV series starring Roger Moore and Tony Curtis. They are more Danny Wilde than Lord Brett Sinclair, I have to say. This Autumn/Winter, Henry Cotton's brings us the Englishman in New York collection. No, they're not intending we all dress like Quentin Crisp. Instead, there are "blazers made with classic English woolen fabrics...and a choice of houndstooth and Prince of Wales patterns." Their other Autumn/Winter collection, HCU, is described as Ivy Style, which might be starting to be a little overused right now. It's as if anything that isn't a tracksuit and trainers can be described as Ivy. I can't pass the opportunity to mention the spine-tingling theme tune to The Persuaders, written by the great John Barry. Arguably, the best thing about the series after some of the clothes.